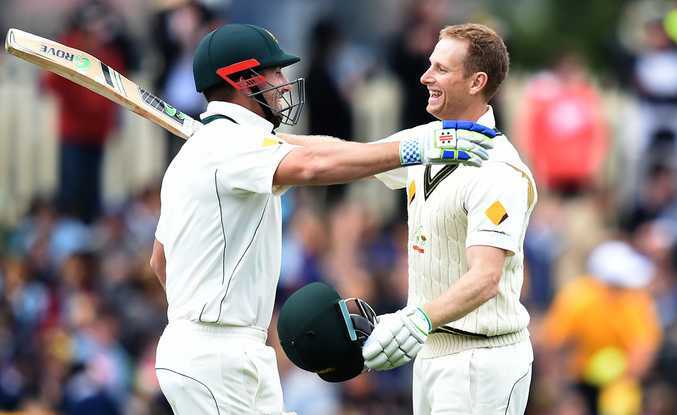 THEY may not be seen as legends of the game, but Australians Shaun Marsh and Adam Voges at least get to rub shoulders with the greats after their epic partnership on day two of the first Test against the West Indies in Hobart. Their 449-run union is now only bettered by greats Don Bradman and Bill Ponsford for the highest-ever Australian partnership (451 against England at The Oval in 1934) in the five-day game. It also broke the previous world-record fourth-wicket stand of 437, set by Sri Lankans Mahela Jayawardene and Thilan Samaraweera, against Pakistan in Karachi in February, 2009. And it was the sixth-highest stand of all-time at Test level. It helped give the Aussies a clear advantage, with the West Indies struggling to 6-207 in reply to Australia's 4-583 (dec). The two resumed their brilliant stand in fine fashion, after Australia started the day at 3-438, continuing to play shots and motor along at over five an over. Both Marsh, who was caught in the deep for 182, and Voges, who was left unbeaten on 269, now have the record for an Australia v West Indies stand. That was previously 382, set by Bill Lawry and Bob Simpson in 1965. Marsh has now made a compelling case to retain his spot for the Boxing Day Test, with elegant Queensland Bulls strokemaker Usman Khawaja set to return from a hamstring injury. It could be his brother and all-rounder Mitch Marsh, who has mis-fired with the bat, who could be left out, only given the chance to make one not out before captain Steve Smith's declaration. Smith pulled the pin at lunch, before his bowlers went to work dismantling the fragile West Indian batting line-up. They did just that until an impressive bit of resistance by the visitors nearing the end of the day. 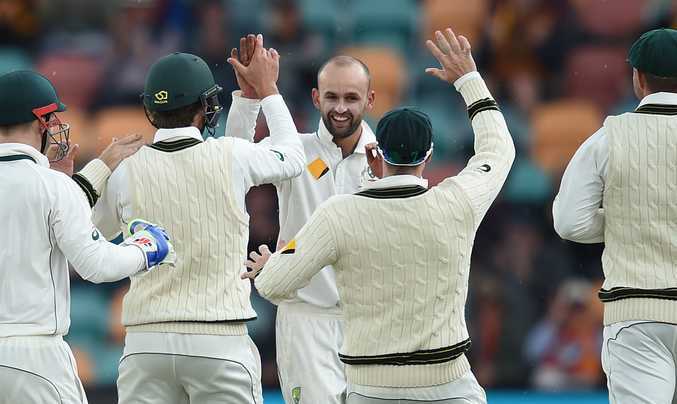 Off-spinner Nathan Lyon - playing in his 50th Test - was the most impressive in the Australian attack. He took 3-43, including the scalps of opener Rajendra Chandrika (25), Marlon Samuels (9) and Jermaine Blackwood (0). Lyon took a brilliant catch off his own bowling, diving to his left, to dismiss veteran Samuels. Darren Bravo (94 not out) batted well to hold his team's innings together. He and captain Jason Holder (15) combined for a 27-run partnership for the sixth wicket. Holder fell lbw to Peter Siddle (1-22). But a poor earlier review by Kraigg Brathwaite (2), who fell leg before to Josh Hazlewood, put pressure on Holder not to review his decision, which should have been not out. The visitors fought hard nearing the end of play though, Bravo combining with No.8 and paceman Kemar Roach (31) for a defiant and unbroken 91-run partnership.